*Please Note that we are not a Party Hostel. San Cristóbal offers so many options to go out and enjoy. If you want any tips on where to go out and enjoy the party scene Our Staff will be more than happy to help out with information! The friendly, multilingual staff is always happy to assist with tourist information, tour and transport bookings and lots of helpful advice! We have a variety of tours including an expedition to a local coffee plantation, horseback-riding, rock-climbing trips, hiking, culturally responsible visits to local Indigenous villages and more. 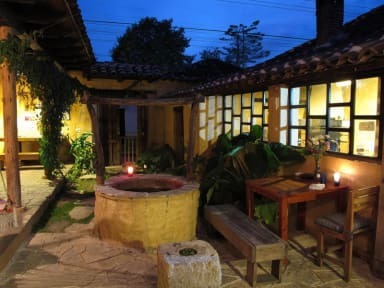 Many tours are unique and only found in Posada del Abuelito! Facilities include: an immaculate 10 bed dormitory, Girls dormitory(4 pax), private rooms with shared bath and private rooms with en-suite bath. Providing a Prefect combination for all your Needs at a Great Value! Guests enjoy the use of a clean, Beautiful community kitchen, warm fireplace and HOT water 24 hours per day with good Pressure in Showers. All rooms are equipped with electrical outlets, FREE bath towels, extra blankets and hangers. There are several places to sit, relax and enjoy our beautiful patio and lovely garden and see the Humming Birds! Guests are welcome to spend the chilly nights in front of the fire in our Living room – drink wine, roast marshmallows, use the computer or just hang out and make new friends! We offer a Wonderful breakfast of Eggs, Gourmet Bread, Cereal, Our Famous Homemade jam, Real butter, coffee from a local Plantation, milk, tea and fruit. Other amenities include FREE internet and Wi-Fi, FREE purified drinking water, FREE luggage storage, FREE lockers in the dorms and on-site laundry facilities at a Reasonable Fee. 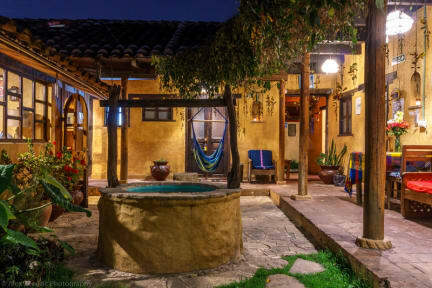 We work hard every day to make the Posada del Abuelito better constantly improving; taking guests needs into consideration making us one the Best Places to stay in San Cristobal de las Casas, Chiapas! We had a perfect stay in this beautiful hostel. We can recommend it to everyone searching a nice and quiet place to overnight. 5 minutes walk to the center, very clean, good facilities, breakfast included. To make things short and simple: the best hostel I have ever stayed in. The place is aesthetic and beautiful. Every part of it, including all the facilities is spottlessy clean. The room was pleasant and nicly decorated. The staff is very friendly, wellcoming and helpful. The atmosphere is both homie and private. the Wifi is strong. kitchen super equipped and easy to handle, great breakfast and perfect location. I honestly could not think of something that should be improved. Our stay at posada was awesome, they greet us warmly. Every morning was cool breakfast in the kitchen with a great homemade marmalade. We enjoyed our time here. It’s a little far from the town centre - about 15 minutes walk, but other than that I have nothing bad to say! Everywhere was clean, the facilities were very good, and the communal area outside is a nice place to sit and relax. The free breakfast is a good addition too! It’s easy to book tours through the hostel. San Cristobal is a great city - I wish I could have stayed longer! Cute little hostel with a lovely vibe that makes you feel right at home. It is nice and clean, quiet at night and the perfect place to relax. Not a party hostel at all. Breakfast included is delicious!! Quiet and pretty little hostel with very helpful and friendly staff. Very nice breakfast with freshly squeezed juice every morning! Great value for money. Pros - Really nice free breakfast, good wifi, nice staff, great hot showers, secure lockers in the dorm, really liked that each bed had a light & socket, very clean, free filtered water. Cons - the mixed dorm is too small for 10 people with their luggage, there is very little storage space. Didn't like the fleecy sheets, they were clean but had a lot of other people's hair embedded in them and were scratchy. Regular sheets would be much more clean & comfortable. Overall I'd recommend! Good location in the centre of San Cristóbal, less than 10mim walk from main street and tourist attractions. Breakfast served even at 3am if you go on a day trip. Possibility to keep your bags after check out.